In this era of cancer genetics, we’ve come to think of cancer as something like a car. Runaway cell proliferation is driven by accelerators, or oncogenes, that are stuck on go—in collusion with broken brakes, or tumor suppressors, that can’t control a tumor’s pedal-to-the-metal growth. A lengthening procession of targeted therapies (Herceptin, Gleevec, Tarceva, Zelboraf) attempt to block various accelerators, and they often succeed in bringing a tumor to a screeching halt—until the malignancy activates a different gas pedal and returns to the road. Lately, increasing numbers of researchers have turned their attention to the excessive amount of fuel that accelerating cancers require, and to how tumors use the fuel. That focus on the metabolism of cancer cells bridges the fields of oncology and cellular metabolism, says Lewis Cantley, a biochemist and the director of the Cancer Center at Beth Israel Deaconess Medical Center, whose work has helped resurrect this long-sidelined approach to fighting tumors. “If we can understand the unique ways that cancer cells use energy, then we may be able to exploit their weaknesses,” Cantley says. Metabolism, in terms of the whole body, is a balancing act. It’s part of a calories in, energy out equation, the reason that eating too much and exercising too little leads to weight gain. But metabolism also happens at a cellular level. Normal cells take in sugar, or glucose, from the blood to generate heat and to fulfill their appointed tasks. Cancer cells do the same thing, but they burn through much more glucose—a supercharged uptake that’s visible on FDG (fludeoxyglucose) PET scans. Oncologists commonly use this imaging technique to help locate tumors, establish the stage of those cancers’ progression, and determine whether they have stopped growing in response to therapy or are relapsing or metastasizing. Many researchers now believe, however, that taking advantage of cancer’s appetite for glucose could go beyond diagnosis and lead to effective treatments. It’s impossible to deprive a patient’s cancer cells of glucose, because the liver will synthesize additional sugar if the bloodstream has an insufficient supply. Yet it might be feasible to scramble the distinctive way that cancer cells metabolize glucose and starve hungry cancer cells to death—or at least to use that approach to complement other therapies. Deciphering cancer metabolism begins with adenosine triphosphate, or ATP—the energy currency that all cells use to power what they do. Under most conditions, cells use oxygen to burn glucose in their mitochondria, located in cells’ cytoplasm, the gelatinous filling around the nucleus. For this, the cells use the tricarboxylic acid (TCA) cycle, also known as the Krebs cycle and as oxidative phosphorylation. In the TCA cycle, glucose, oxygen and other chemicals are modified, combined or broken down into components (metabolites), some of which re-enter the cycle while others go off to perform other duties. This process generates ATP, with carbon dioxide as a by-product. Occasionally, though, a cell will become oxygen-depleted, or anaerobic, such as when someone tries to sprint 500 yards. “For the last 100 yards, your leg muscle cells aren’t getting oxygen,” says Raul Mostoslavsky, a molecular biologist at Massachusetts General Hospital Cancer Center. Muscle cells are then forced to switch to glycolysis. Compared with normal cellular metabolism, which can generate 36 units of ATP per molecule of glucose, glycolysis seems grossly inefficient, producing just two units, with lactate as a by-product. Lactate is acidic, and it’s what makes muscles ache following anaerobic exercise, says Mostoslavsky. But extreme exercise isn’t required to force cancer cells to opt for glycolysis. In 1924, Otto Warburg, a German biochemist who later won the Nobel Prize, observed that malignant cells use glycolysis even when they have enough oxygen. Aerobic glycolysis, now known to happen in almost all cancers, is called the Warburg effect. Why would cancer cells switch from a mechanism that produces maximum energy to such a wasteful use of glucose? Warburg proposed that it resulted from damaged mitochondria, leaving the cell no other choice. He also contended that this altered metabolism was the cause of cancer, and for decades that notion was at the center of cancer research. 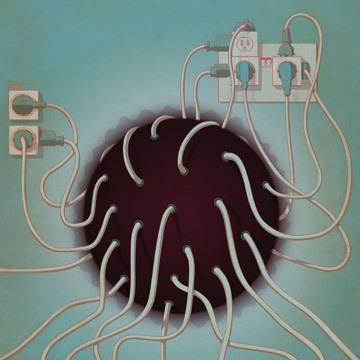 1.“Links Between Metabolism and Cancer,” by Chi V. Dang, Genes & Development, May 1, 2012. Dang reviews the evolution of the theory that altered cellular metabolism contributes to cancer, in light of the discovery of oncogenes and oncometabolites. 2.“The Metabolic Profile of Tumors Depends on Both the Responsible Genetic Lesion and Tissue Type,” by Mariia O. Yuneva et al., Cell Metabolism, Feb. 8, 2012. An account of the discovery that tumors in mice metabolize glucose and glutamine differently depending on whether they are induced by the Myc or Met oncogene and on which tissue the tumors arise in. 3.“Targeting Cancer Metabolism: a Therapeutic Window Opens,” by Matthew G. Vander Heiden, Nature Reviews Drug Discovery, Aug. 31, 2011. Can we therapeutically target the metabolic alterations in cancer cells? We already have, since some approved drugs intervene in cancer cells’ specific metabolic needs, but research into how altered metabolism promotes cancer is leading to more directed efforts.